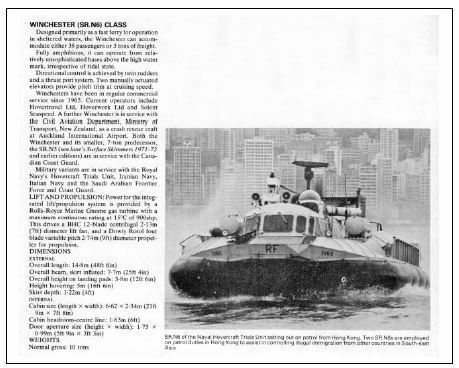 Many HK residents will recall the HYF’s and Discovery Bay rigid side-wall hovercraft racing through the harbour during the 1980s and 1990s. 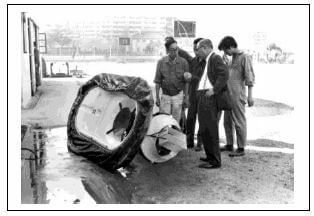 However, true air-cushion hovercraft came to Hong Kong in the late 1960s or early 1970s, introduced by amateur owners and based at the Far East Flying Training School at Kai Tak. After the invention of the hovercraft in UK in the 1950s, it was quickly developed into many types of machines with varying commercial success. Amateur designer/builders soon sprung up and developed their own designs by organising competitive trials and racing them. A single-seat basic model appeared in the FEFTS hangar where it was pictured being inspected by the owner, FEFTS Principal Mr HW Watt, and pupils of the school. 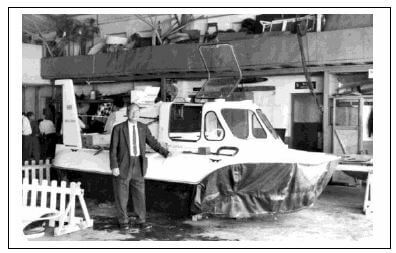 Later, a much larger hovercraft, professionally built, complete with enclosed cabin also appeared in the FEFTS hangar. This writer vaguely remembers it being the subject of an incident on the southern shores of HK Island where it had flipped over in the sea. After an enquiry, the Civil Aviation Department or perhaps The Marine Department took a dim view of these machines and they appear to have disappeared from the amateur scene. In the 1970s, illegal immigration was a problem for Hong Kong with many II’s trying to cross the shallow waters and mudflats of Deep Bay. To assist the Marine Police, the Royal Navy brought in an SRN6 Hovercraft Unit from the UK and established a base on Stonecutters Island in the late 1970s early 1980s. The SNR6 were advanced machines for their time, and large and fast. When starting up and their gas turbine engines running, they could be heard all around the harbour. What IIs thought of them as they raced across Deep Bay in the dark towards them while in the water and mud is unknown. Especially when the hovercraft’s hull rose up as its flexible side-walls inflated. One of the SRN6 was involved in an incident when a collision occurred with a Chinese gun-boat and the hovercraft was placed under guard by military personnel from gathering gun-boats. Negotiations ensued that eventually led to the release of the hovercraft. 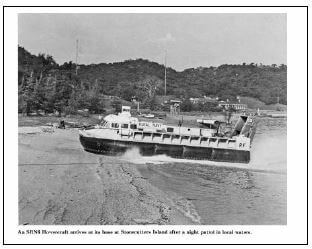 After the Royal Navy hovercraft returned to the Borneo or the UK, the harbour scene was left to the side-wall hovercraft operated by local ferry companies. 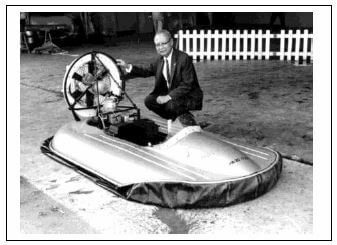 However, the writer who has had a long interest in Hovercraft, designed and constructed a radiocontrolled model hovercraft in the mid-1980s for his son. This was based on the SRN1 full-size hovercraft that first demonstrated the principals to the public and even crossed the English Channel. The model was operated on the Tuen Mun reclamations on weekends when they were generallyempty. The areas were flat with convenient shallow ‘lakes’ of rainwater. 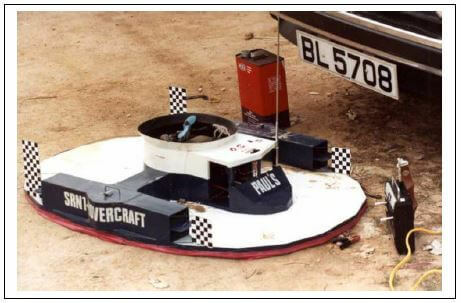 These were utilised todemonstrate that hovercraft could travel and manoeuvre over land and water with ease. 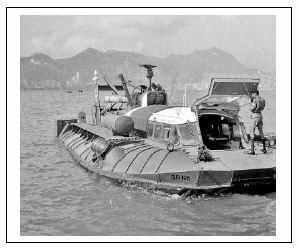 A press release in 2011 highlighted that the HK Fire Department was taking an interest in a smallCanadian hovercraft for rescue duties. Macau Airport also appears to operate a rescue Hovercraft.